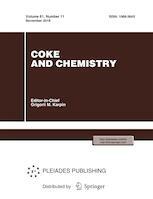 Coke and Chemistry is published under the auspices of a number of plants and organizations of the coking industry of Russia, Ukraine and Kazakhstan. A valuable feature of the journal is the inclusion of statistics on the supply and demand situation in the Former Soviet Union for coke and coke byproducts and information on calculating production costs and prices. is published under the auspices of a number of plants and organizations of the coking industry of Russia, Ukraine and Kazakhstan. A valuable feature of the journal is the inclusion of statistics on the supply and demand situation in the Former Soviet Union for coke and coke byproducts and information on calculating production costs and prices. Coke and Chemistry is a peer reviewed journal. We use a single blind peer review format. Our team of reviewers includes 21 reviewers, both internal and external (30%). The average period from submission to first decision in 2017 was 7 days, and that from first decision to acceptance was 30 days. The final decision on the acceptance of an article for publication is made by the Editor-in-Chief.